For one, when a white man comes to me and tells me how liberal he is, the first thing I want to know, is he a nonviolent liberal, or the other kind…If you are for me and my problems- when I say me, I mean us, our people then you have to be willing to do as old John Brown did. 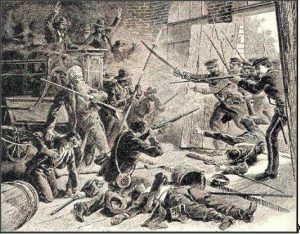 It was on this date in 1859 that abolitionist John Brown and twenty-one others raided the federal arsenal at Harper’s Ferry in what is now West Virginia. The plan, like that of Nat Turner some twenty-eight years earlier, was to foment an uprising of enslaved persons. Two days later, a detachment of U.S. Marines stormed arsenal, ending the plot. Ironically, the Marines were led by two future leaders of an effort to cleave away from the United States a country committed to the preservation of slavery. Today, it is John Brown who is still considered the radical. The names Robert E. Lee and J.E.B. Stuart are affixed to numerous public buildings and features, their images memorialized in monuments. At the time, moderates in the North disavowed Brown’s raid as do moderates in the present. Most, it can be argued, who professed themselves anti-slavery persons favored a gradual, compensated emancipation of the country’s roughly four million bondsmen. Derision and social ostracism was the bounty for those few abolitionists, (not to be used interchangeably with anti-slavery), who for thirty years had demanded the immediate end of slavery, albeit through mostly legislative means. We all know both John Brown’s fate and that of more than 625 thousand Americans within six years of the poorly planned, badly executed raid on Harper’s Ferry. But what we fail to recall is the pattern of, (mostly), white moderates to support, much less engage in, direct action against forces that fall squarely into the ledgers of history as having been evil. In only twelve short years after the final deaths of the Civil War, Reconstruction was unceremoniously pulled from under the feet of the Freedmen. The culprits? White Northerners who had not only tired of measures enacted by radicals but whose economic insecurities following the Panic of 1873. For the next four generations, lynchings, Jim Crow, and voter suppression was the order of the day for those descended from enslaved persons. When the modern Civil Rights Movement began to gain traction through legal agitation and civil disobedience, it was, again, white moderates who expressed disdain for the tactics those without political power employed against those who did. It must be remembered that the Freedom Riders were a tiny minority of young people. Today, many white liberals born during the Second World War would have you believe the entire generation was putting itself in mortal danger in support for the idea of racial justice. These false narratives are reminiscent of how practically every Frenchman in the south of France claimed to have served in the Resistance, despite the fact of living under the Vichy government. No, on this anniversary of John Brown’s Raid, we need to do more than revisit a controversial event from our past. I argue that we need to truly honor America’s radicals, our immoderate voices on the left, our disobedient activists who make the boutique liberal squirm.